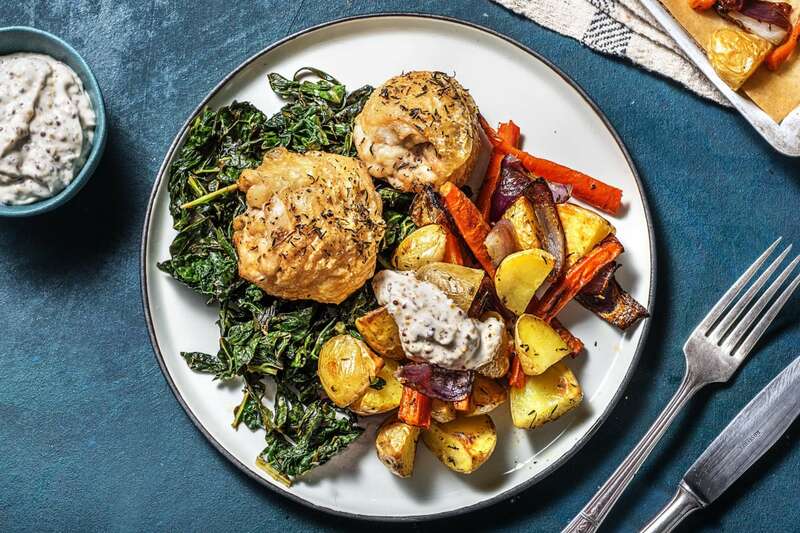 This Chicken with Roasted Veg is bursting full of flavours and make the perfect dinner night option, from HelloFresh. Cook up a fresh start! Preheat your oven to 200°C. 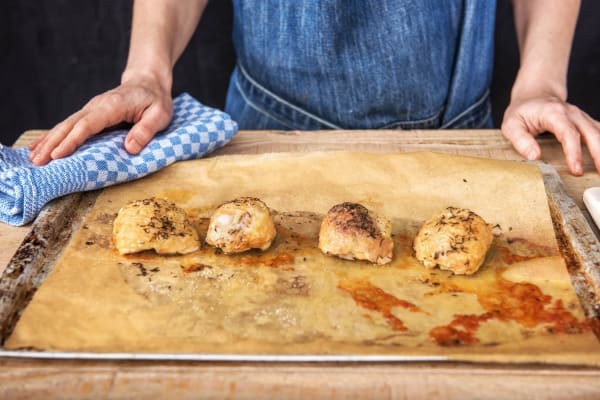 Pop the chicken thighs on a lined baking tray and drizzle on a splash of oil. Season with salt, pepper and half the dried thyme. Use your hands to rub the flavours all over the meat. Spread the chicken thighs out flat, skin-side up and roast on the top shelf of your oven until golden and cooked through, 30-35 mins. IMPORTANT: The chicken is cooked when it is no longer pink in the middle. Meanwhile, chop the new potatoes into 2cm chunks. Trim the ends from the carrot (no need to peel), quarter lengthways then chop into finger length batons. Halve, peel and chop the red onion into six even wedges. Put all the veggies on another lined baking tray and drizzle over a splash of oil. Season with salt and pepper and sprinkle on the remaining dried thyme. Toss to coat then spread out in one even layer. 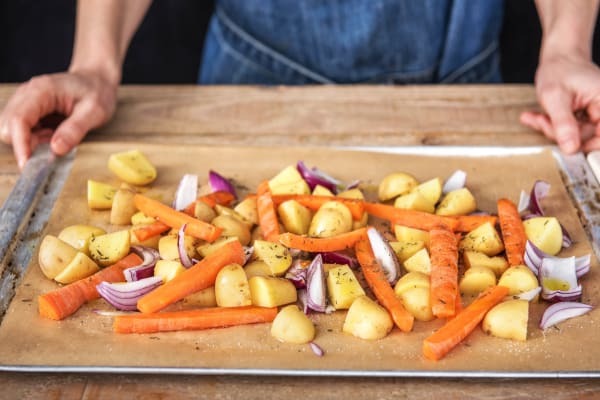 Place the tray on the middle shelf of your oven and roast until the veggies are golden and soft enough to eat, 20-25 mins. Turn halfway through cooking. 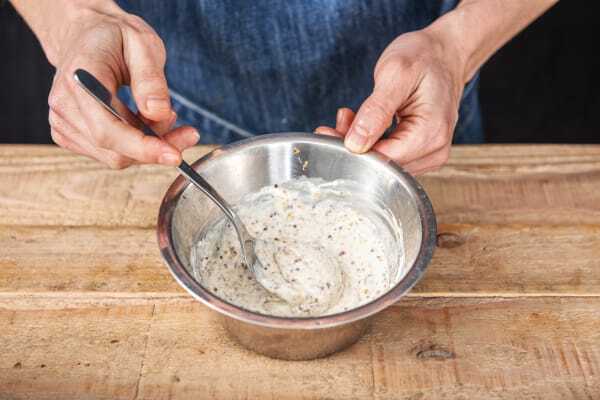 Pop the mayo and wholegrain mustard into a small bowl and mix well to combine, set aside. 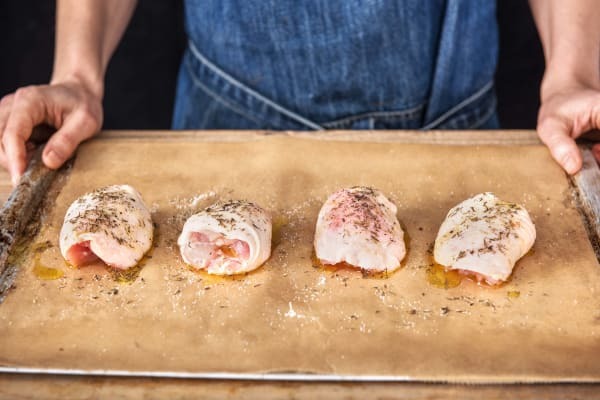 While the chicken and veggies are cooking, peel and grate the garlic (or use a garlic press) then heat a drizzle of oil in a frying pan on medium heat. 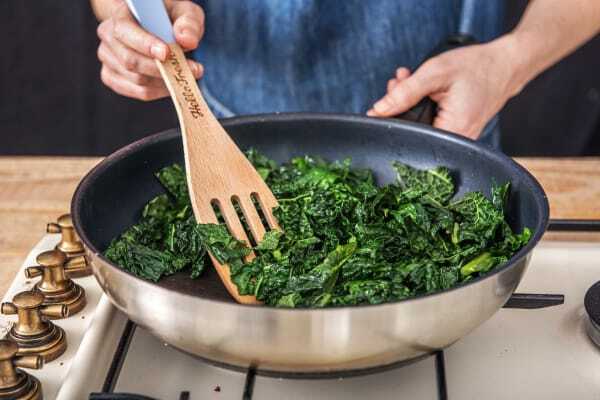 Once hot, add the cavolo nero, a splash of water and the garlic. Stir and pop on a lid. Cook until the leaves are tender, stirring every now and then, 4-5 mins. When ready, season with salt and pepper and keep to one side. When the chicken and veggies are ready, remove both trays from the oven and leave to rest for a few mins before serving. TIP: This will make the chicken more juicy when you eat it. 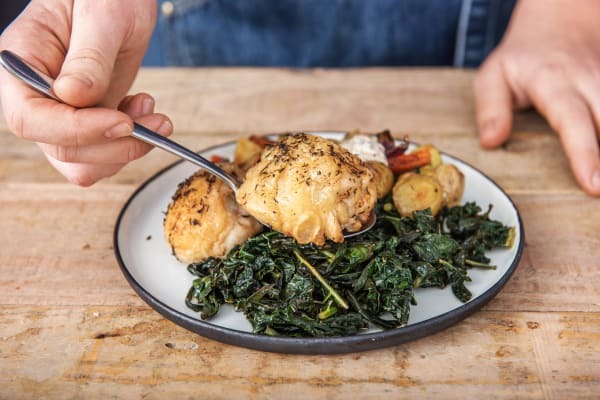 Reheat the cavolo nero if necessary then share between your plates. Leave any excess water behind. Top with the chicken thighs. Serve the roasted veggies alongside and finish with a dollop of mustard mayo. Enjoy!